Welcome to the Capela dos Ossos in Evora, Portugal. Also known as the Chapel of Bones, it is the most well-known attraction in Evora, Portugal, and well worth a visit. The sinister rhyme above the doorway translates to “We, the bones that are here, await yours,” and as the inscription suggests, the Capela dos Ossos is a room full of bones! As your eyes adjust to the chapel’s lighting, the bones of an estimated 5000 deceased can be seen, their bones set into the concrete as bricks into mortar. Hundreds of empty eye sockets gaze blankly at you from the walls and ceiling, where they were carefully placed so long ago, these skeletal remains of the dead. The ceiling is frescoed with sinister images and Latin phrases pertaining to death. The musty air even smells what it could be imagined death smells like. Possibly the most disturbing of all, the chilling corpses of an unknown infant and adult are chained to the wall. Opposite them, small windows allow light to penetrate the dark room, allowing shadows to move ghoulishly across the walls, giving a feeling that the dead may live on in this room. 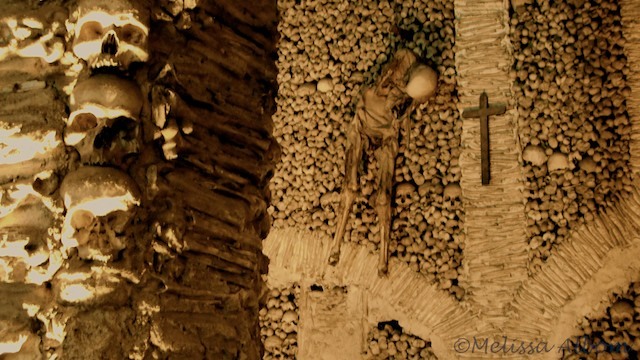 Built by Franciscan monks in the 16th century using bones from graveyards around Evora, the ossuary is a sinister reminder that death will always come. This room was created to solve the issue of overcrowding in cemeteries all around Evora, and also serves a purpose as a powerful momento mori. This quote from a poem (translated) inside the chapel sums its goal up pretty well: Recall how many have passed from this world/Reflect on your similar end. As you leave the chapel, the heat whisks you away from the chill of death, the sensation almost enjoyable. One last look at the gruesome contents of the Capela dos Ossos leaves haunting memories that will last a lifetime. Welcome to the Capela dos Ossos in Evora, Portugal! Also known as the Chapel of Bones, it is the most well-known attraction in Evora, Portugal, and well worth a visit. Very creepy! Nice picture! Love the ending sentence "leaves haunting memories that will last a lifetime".